So, here's the deal. I threw the book at the end. Legit. It flew and then fell on the ground. Do I feel bad? No. Not really. Whether it was out of frustration or feeling all the feels, I'm not quite sure. It was something. Now, time for a list because that will be more consistent then my ramblings. More dimensions! I mean, that was what I was looking forward to. Some of these dimensions were a tad darker and seemed to have a lot more tragedy to them. Wars, mafias, and crazy people. So yeah, I liked the variety there. It's always fun to see the different dimensions. Again, THE COVER. I know I raved about it in my review of the first book, but let the raving continue. Because, let's be honest, all covers need to look something like this. I mean, not exactly this (because diversity in covers). BUT THESE COVERS ARE GOALS. It reads quickly. There came a point where I couldn't put it down because I just wanted to know. And the pacing was good at the end. So much was coming together in the series and it was fun to read. The beginning... This was my complaint last book, and I'm sad to say that it didn't get any better. It was just as info dumpy as the first. Which is never fun to read. I mean, I wish they wouldn't start in the action and would just go through the in between stuff instead of making me think the book is going to start at this cool scene but JUST KIDDING, we need to go back and explain the last three months. Kill me because, THE LOVE TRIANGLE. I was honestly hoping this would die in this book. I mean, Marguerite already discovered she was in love with Paul. GREAT. Stick with that. But no, (view spoiler)[Marguerite and Theo just have to travel to a universe where they were a thing. And it causes Marguerite to question if she should be with Paul because they thought they'd be together in every universe. And she was horrified by the things mafia Paul did, which caused her to question more. Which, I mean, is fine. Whatever. But it grew exhausting. (hide spoiler)] This series's strong suit is NOT the romance and relationships. So let's not make it the main crux of the entire series. Thanks. Jumping into other Marguerites. This brings in so many problems. Like, ahem, (view spoiler)[getting another version of you pregnant?! (hide spoiler)] I'm glad that Marguerite begins to question the ethics of all of this inter-dimension jumping and taking over people's bodies (because it's a problem), but that didn't stop her from doing it. Which is probably something she'll deal with in the next novel. But still. Why haven't more dimensions questioned the ethics of this? No? Only one? Again, I think I'll rate this book around a 3.5/5. The concept is still intriguing and I'm interested to see how that cliffhanger plays out. I'm still not in love with the characters though. Maybe the next book! Maybe it just takes three books to grow attached to them. Here's to hoping. 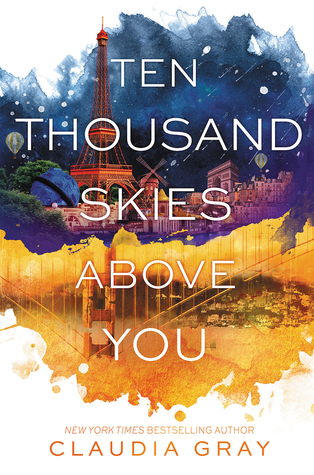 Sign into Goodreads to see if any of your friends have read Ten Thousand Skies Above You.